Karen Bentley sends a monthly email newsletter to subscribers from all her websites. The newsletter announces upcoming events, summarizes relevant posts, provides other interesting or helpful information, and occasionally features special discount offers on programs and products. 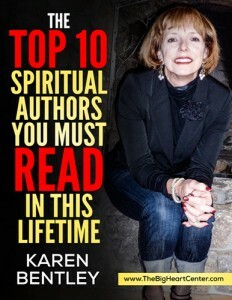 All new subscribers receive a FREE immediately downloadable copy of Karen Bentley’s list of The Top Ten Spiritual Authors You MUST Read In This Lifetime, an essential reading list for anyone on a spiritual path. By the way, your email address is never shared, sold or disclosed to anyone. Ever.